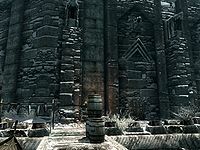 The East Empire Company is the regional office for the company on the docks of Windhelm. The offices are almost completely bare and run down before completing the relevant quest. It is located between the Clan Shatter-Shield Office and the western end of the docks. * This person only appears once you return from Dawnstar with information during the relevant quest for Orthus. When you first visit the office it is dark, dusty and full of cobwebs. There are round wooden tables in alcoves to the east and west, with latter holing the Business ledger and a level locked non-respawning strongbox containing random items on top. There is a partition wall splitting the building into two rooms with a doorway in the middle joining them. The rest of both rooms contain a few crates and food sacks, but not much else, except empty shelves. After completing the quest Rise in the East, the offices and company will be restored. Once restored it is fairly well lit, clean and tidy. There are still crates, barrels and sacks of foodstuffs all around both rooms. There is a set of shelves to the left of the doorway holding a draught of strength, a solution of strength, a philter of the defender, a woodcutter's axe and a bottle of each; alto wine, wine and Nord mead. To the right of the doorway is a dresser containing clothes and having a bottle of wine and a bottle of Nord mead on top. To the east, against the wall is a long wooden table holding a bowl and bottle of Nord mead. Through the doorway into the second room there is a set of shelves holding copies of a complete set of Brief History of the Empire books, Report: Disaster at Ionith, Mixed Unit Tactics, Lost Legends, The Cake and The Diamond and Darkest Darkness. In the Northeastern corner, on a crate is a bottle of alto wine, and in the southeastern corner, in a bucket on the floor is a medium coin purse. The dressers in the location are non-respawning. This page was last modified on 30 June 2018, at 20:09.